The muscular Alapha Blue Blood Bulldog is a responsible guardian and family pet that is bred solely for security and companionship, unlike its cattle and pig herding ancestors. With a sturdy and well-balance build, the Alapha Blue Blood Bulldog is agile and athletic for its size. This breed has the same face as any other Bulldog but features a body that is higher in leg and less stout. Additionally, this dog breed naturally has a long tail that does not need to be docked, unlike the English or American Bulldog breed. The Alapha Blue Blood Bulldog gives an impression of nobility with its alertness and makes an excellent companion and watchdog. These dogs are known to be protective of their family and are great with children. They can do well with other pets. However, this breed can be aggressive toward strangers approaching the home and should be restrained with a fence. As an athletic and intelligent family pet, the Alapha Blue Blood Bulldog is an ideal protective family pet and responsible guardian. Alapha Blue Blood Bulldogs are excellent guardians and watchdogs. They are intelligent, athletic and display a protective feeling of responsibility toward their family and property. These dogs will become aggressive toward intruders yet they make sufficient companions. With a short coat, the Alapha Blue Blood Bulldog requires minimal grooming. These dogs should only be bathed when necessary. This breed of dogs does not have many known health problems. The Alapha Blue Blood Bulldog is susceptible to Entropion or inversion of the eyelids. These athletic dogs are active and enjoy exercise. A daily walk or play session is recommended for the Alapha Blue Blood Bulldog. Proper training is recommended starting at an early age for this dog breed. 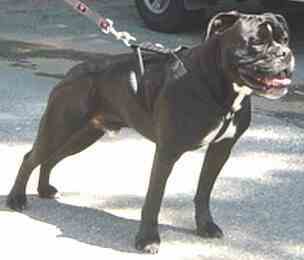 As naturally territorial dogs, the Alapha Blue Blood Bulldog may become overly territorial if not properly raised.